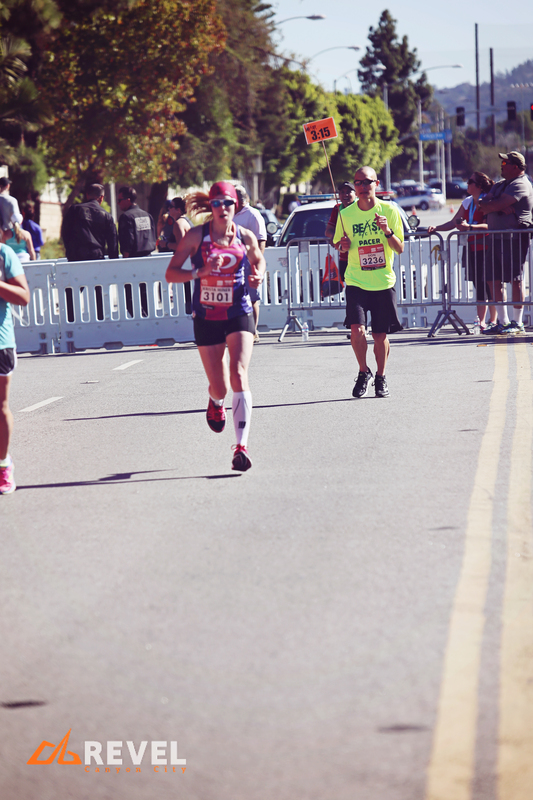 Rounding the corner to the finish line at the 2015 REVEL Canyon City Marathon, in Azusa, CA. This time last week I was on a plane headed for sunny Ontario, California, to meet up with family and a Portland-based friend to run the REVEL Canyon City Marathon course. I was able to run this course last year in its inaugural year. 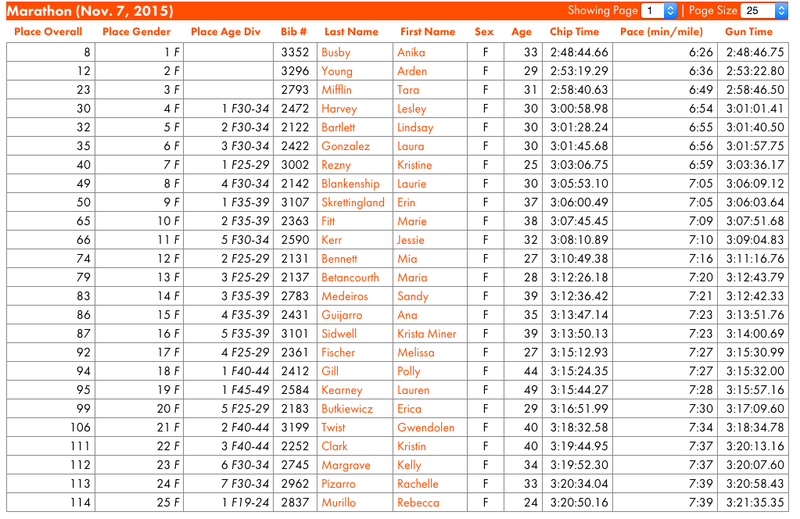 It is my favorite race I have ever run for a few different reasons (see the race entry from last year). REVEL puts on great races. Since my first marathon last year, 5 of my 7 marathons have been in REVEL-organized races. The courses they offer are fast and scenic and you can’t beat their organization. They didn’t disappoint this year at the Canyon City Marathon. In fact, they only improved upon last year. This year the race field was larger, the expo was bigger, and the buses were nicer. Always improving should be one of REVEL’s mottos; they are always looking for ways to better each race/course from year to year. I like this evolving approach they have to the sport. What follows now is my race recap. Since this blog is primarily a place for me to house my running stories, it will be filled with details that may or may not interest you, but each detail is meaningful to me. Thanks for reading…. After a very early start for an 8:15 am flight out of Denver, I spent the remainder of my first Ontario day carb loading, keeping my feet up, and chatting with my friend, Annie, and my cousin, Monique at her Chino Hills home. Monique hosted my friends and I the year prior and was gracious enough to do it again. After visiting the expo and getting our race bibs and swag (love the race singlet they offered this year) we decided to drive the course to help us mentally prepare. This was both a good and bad idea. When you drive for 26.2 miles, it really hits you just how far you will be running. It seems incredibly far. (Probably because it is!) As we snaked up some of the steeper, curvier pitches toward the top I was feeling really humbled. Here is when my lack of hill training started to make me nervous. I had to mentally reassure myself that: 1) I had run the course the year before and loved it; and 2) I had run the REVEL Big Cottonwood Marathon with its mile drop in elevation without any hill training either and faired fine. We returned to home base for a 6:00 pm pasta, rice, chicken, vegetable dinner and race prep. I’ll be honest, after 16 months of constant running/training and 6 marathons, I was filled with anxiety for this race. My training sessions had been revealing tired legs and an annoyed IT band that had found its voice. The longest run I had done since my marathon was 13 miles. My heart was ready for this race, but I wasn’t confident that my body was. I wrestled with deferring my entry, or transferring to the half marathon distance. My biggest fear was injuring myself. But I had made certain goals for the year and I really didn’t want to end my 2015 race season with them incomplete due to my worries and “what ifs.” In the end, I really felt like I could do it, and thought it was definitely worth trying. I could always pull back once the race started if I was feeling like my body wasn’t going to be able to do it. So I committed, and tried to push my doubts aside. I had a goal to PR on this course and had Race Smart Pace Bands for 3:10 and 3:14 finish times, but wasn’t sure which goal to pursue. 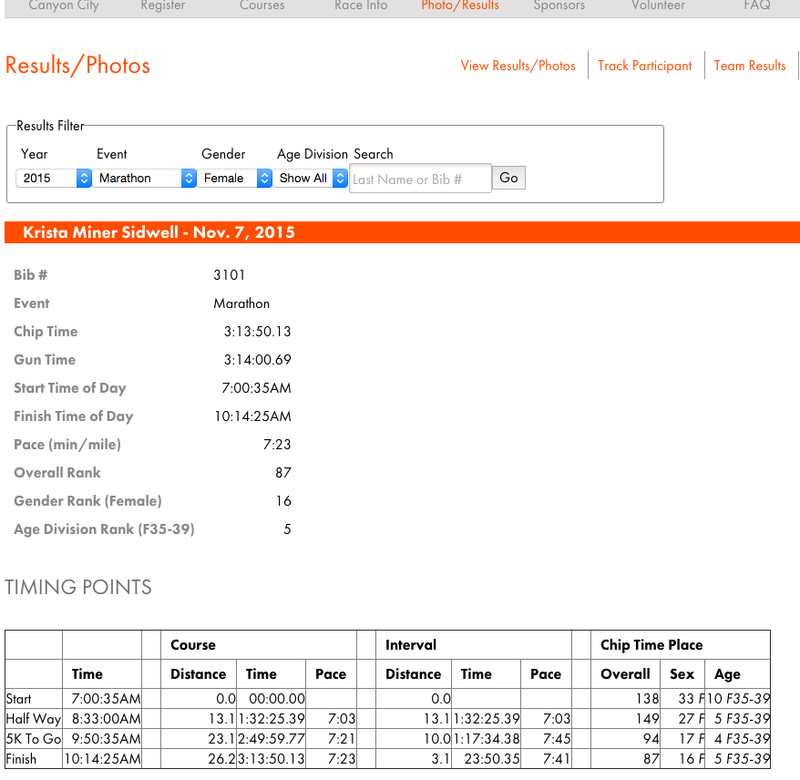 My race time 8 weeks prior on the REVEL Big Cottonwood Marathon course was a 3:19. I was looking to take 5-9 minutes off my PR and I wasn’t sure if I was being realistic. The REVEL Canyon City Marathon course was the course I had most been looking forward to all year. Not just because of the beauty and speed of the course–and all the associated positive memories from the year before–but because this course starts at 5,700 feet in elevation (I train at 5,000) and ends at 600 so my high-altitude training and extra red blood cells oxygenating my muscles would give me an edge over the other races I had run so far. In the end, I decided to go with the more conservative race goal of 3:14 and I am glad that I did. Between 8:30 and 9pm, I tried, and failed, to rid my body of some serious pre-race angst. 8 weeks hadn’t been long enough for me to forget how hard marathons are. 8 weeks hadn’t been long enough for me to forget the painful post-race recovery journey. But, 8 weeks had been just long enough to remind me of how much I love to run, how much I love to cross the finish line, and how good it feels to achieve something you’ve worked hard for. In the end, with warring emotions, I finally succumbed to a deep sleep, waking at 2:45 am to prepare for the day’s events. I had laid out all my clothes/tools the night before the race so the morning was pretty quick and easy. I dressed and consumed my regular pre-marathon breakfast (oatmeal with peanut butter and a bagel) 2 hours before the race start and then Annie and I drove to meet the buses. There was a little excitement when we accidentally parked in the half marathon parking lot and walked blocks to the front of the bus line only to find we were in the wrong place. We had to use up precious glycogen to jog back to the car and maneuver–quickly–to the marathon lot and onto a bus before they all left. Giving yourself extra time always pays off! We were glad we had given ourselves an extra 30 minutes that morning! On the bus, I had my two Advocare O2 Gold® pills (to enhance my body’s use of oxygen) and my Crunchy Peanut Butter Clif Bar an hour from race start. Once we arrived at the top of Azusa Canyon and disembarked the bus, we hit the porta potties for some relief and then continued our preparations. It was chilly up top, but I had my thrift store throw-away clothes to keep me warm during the 15-minute window between gear bag drop and the race start. SOO glad I had those, although the space blankets REVEL provides are effective too. I took some time to talk to the 3:10 pacer and the 3:15 pacer to find out what their course strategies were. The 3:10 pacer seemed nervous and admitted he was pacing his first race. My instincts told me I should stick with my 3:14 pace goal. The 3:15 pacer was sharp and asked me thoughtful questions about my race goals. He informed me that if I was able to get under 3:15 I would qualify for the New York City marathon. I hadn’t realized that and he made me want to reach my goal even more after talking to him. I consumed my Clif Shot Cherry Chocolate energy gel 15 minutes before the race start, parted ways with my friend, and went to the front of the pack to join the 3:15 pace group near the starting line. I would run my own race, but position myself near them to get off to a good start. I felt sort of foolish standing there with the 3:15 pace group. I was surrounded by men. There were a couple girls scattered here and there, but primarily I was surrounded by men. Was I kidding myself that I could do this? I decided it was time to shut the door on my doubts. While I can argue that they may keep me grounded, the ground was not where I planned to be that day; I needed to fly. My doubts would play no helpful role in my success. I started to tell myself that I belonged there. I had worked and trained for this. It was up to me to go out and do it. No excuses. 7:00 am came and, BOOM! We were off. After enduring the marathon taper, my body was ready to run. It needed to run. I took off and had no problem hitting my splits. My body felt strong, my tunes were honed in and doing their job; I was dialed in and ready to go. 45 minutes in and every 45 minutes after I took in a GU Roctane energy gel. These work great for me. The main ingredient in them is Maltodextrin–one of the highest glycemic index carbohydrates available. Maltodextrin’s low osmolarity and quick absorption rate makes it a great choice for endurance athletes. These gels also pack a generous 125mg of sodium and 55mg of potassium. I never suffer from cramping of any kind when using these gels. You need to take them with water. I like to take in a cup of water from each aid station I pass. Most aid stations I will quickly walk through so that I don’t spill all of my water. You make up the few seconds easily on the course. It is worth it to just walk and make sure you get the water in! This way, I don’t have to be weighed down carrying water while I run. All I have on me are my gels and my tunes. Well, and my clothes. The first 13 miles of this course flew by. You really have only one, short hill during this segment. My right IT band was starting to talk to me and I prayed that it would just hum and not yell for the rest of the race. Miles 15-21 are trying because they are hilly. Honestly, after all the earlier downhill miles, you are grateful for some uphill terrain to give your muscles a break. My race was going well at this point. I was meeting all my splits and I felt strong. There would be no hitting the wall today. This isn’t to say that I wasn’t offering up pleas for strength and endurance at every turn–I was–along with practicing my visualization techniques and exercising every form of disassociation available to me. Marathons are hard, no matter how well you train or how many you do. If you are pushing yourself faster, they are hard every time. You find yourself in this place where you are crossing over from a very physical realm to a very spiritual realm to achieve your goal. You have to find strength from both to succeed. Around mile 24, the 3:15 pacer passed me. This was really confusing to me. My pace watch still had me coming in at a 3:14. Was my watch off?? What was going on? Maybe he was bringing in the guy and girl running with him faster so they could make sure to be under 3:15 for a qualifications standard. But part of me got worried that my watch was wrong so I started to chase down the 3:15 pacer like a rabbit chases a dangling carrot on a stick. I wanted to keep my split times and not sabotage the end of my race, but I also wanted to narrow the gap between him and me. He was like 50 yards in front of me. For the remainder of the race I just kept trying to–conservatively–catch up to him. I started thinking about my kids around this point. I visualized them at the race finish even though I knew they wouldn’t be there today. I visualized their smiling faces and encouraging yells and tears came into my eyes. I visualized the clock and how it would feel to achieve my goal. I only had to stay strong for a couple more miles. . . .
You come around a corner at mile 25 and you see it. What is that mirage in front of me? It can’t be. Wait, it is. A hill. They changed the course from last year and there is a hill at mile 25. Argh!! No! That sight really took the wind out of my sails. My body was feeling the fact that I hadn’t ran a long run past 13 miles in 8 weeks. My heart was working harder. I was working harder, but I was so close. 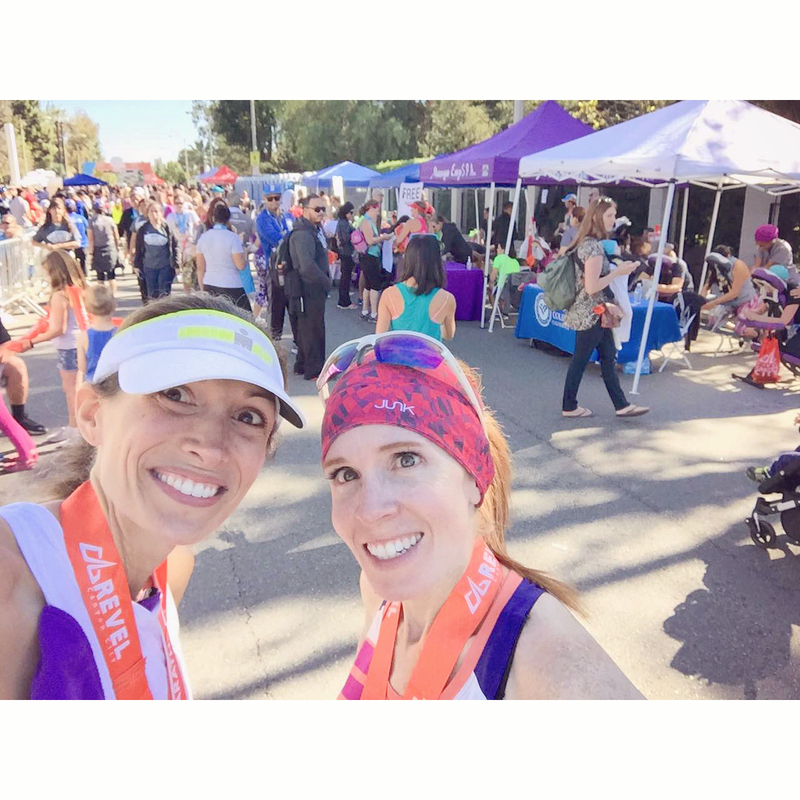 Post-marathon text from my great friend–and star of this blog–Natalie Brown. She’s the best. I concentrated on putting one foot in front of the other and keeping my 7:30 pace goal. I kept trying to catch the 3:15 pacer. Then, I heard the most welcoming sound…crowd noise. I couldn’t see the finish line, but I could hear it. The energy of the crowd was tangible and I fed off it. I let it fill me and it gave my kick a little boost. I was going to do this. I finally passed the 3:15 pacer and there it was, the finish line. I started to run as fast as my legs would let me using my arms to power my stride. I could see the clock. I was under 3:14! So my watch was right. I sprinted to a 3:13:50 finish. That 3:15 pacer had helped me get under my time goal. That…that was a great moment. I qualified for the New York City Marathon and I qualified for the Boston Marathon with a time that the guys in my age group would need to qualify–a secret goal of mine ever since I learned of the HUGE discrepancy between the men/women qualifying standards. (Not that I am a feminist or anything…). I crossed the line, smiled, and enthusiastically accepted my medal. I did it. I had taken 17 minutes off my time between the Boston Marathon in April and this race in November. So my IT band never started yelling at me during the race–my body’s endocannabinoids, endorphins and opiates did their job–but it definitely started to get louder after the race. I downed a couple cups of gatorade and then went straight for my gear bag to get my 1,000mg dose of potassium via coconut water for recovery. Then I generously applied Kool N Fit Performance Sports Spray (with camphor and menthol) to my sore, stiffening muscles. This stuff works immediately to alleviate pain and increase mobility. Love it. A must-have in a marathoner’s gear bag. Then I went to look for my friend who was set to finish about ten minutes after me. Annie and I at the finish line celebrating meeting our time goals and a great race! Annie, actually came in at 3:21, totally obliterating her 3:25 goal and setting a PR/BQ. I wish I had seen her cross the finish line, but it was fun to reunite with her and swap stories about the race. We both were feeling amazing. 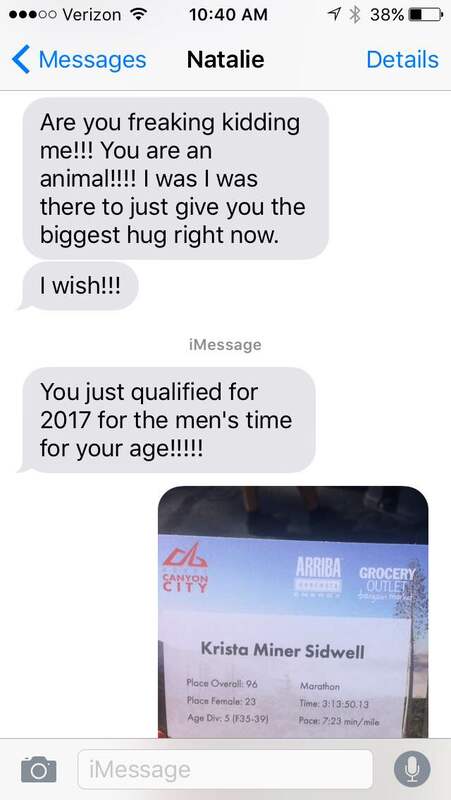 My husband had signed up for live text results during my marathon that let him know how I was doing at the half mark, the 20-mile mark and when I had 5k to go. (Another awesome REVEL Race perk.) I was touched to learn that he was tracking me so studiously (and secretly) during a church youth song practice he was helping out at during my race. He was discreetly passing race updates to my children while they (and 140 other children) practiced. He was also text-forwarding my results to my good friend and they were discussing me back and forth while I was running. I was moved to hear of their support and to learn of how emotionally invested they were for me. Friends/children like that carry you in invisible but powerful ways. Every marathon I finish I want to cry when I’m done. Every one has tested me as I have tested me. Seemingly small gestures from friends and loved ones can mean so much; do so much. Talking to my excited children is always the highlight of the day. They are such a large part of why I race. I want them to believe in themselves and to understand that we are the only ones that put limits on our potential. We must not do that. We believe. We set goals. We endure. We enjoy. We fall, but we rise. We grow. We find joy. My 2015 race season is done and I’m looking forward to my 5-week recovery and easing back into my training for Boston in 2016. Next up will be the Phoenix Half Marathon in February 2016. 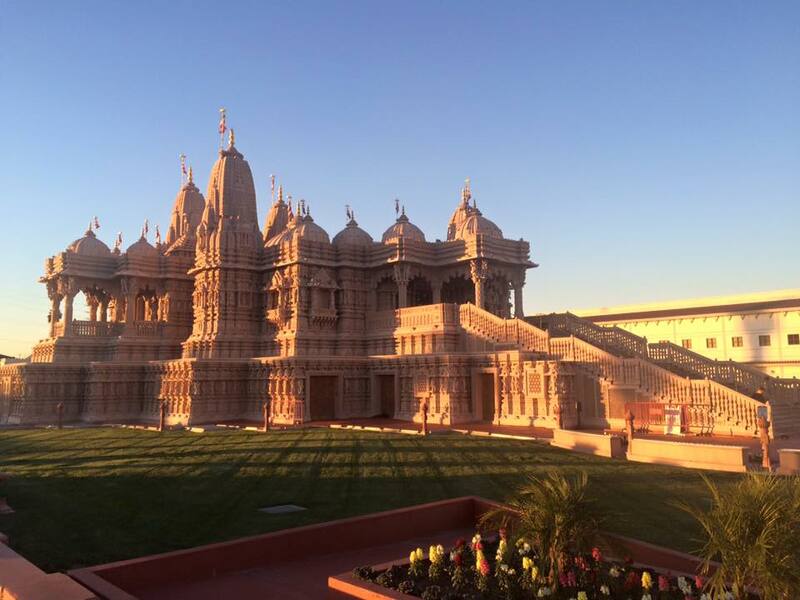 You MUST take a slight detour and visit this intricately hand-carved Hindu temple in Chino Hills.This private tour was a highlight of my trip. 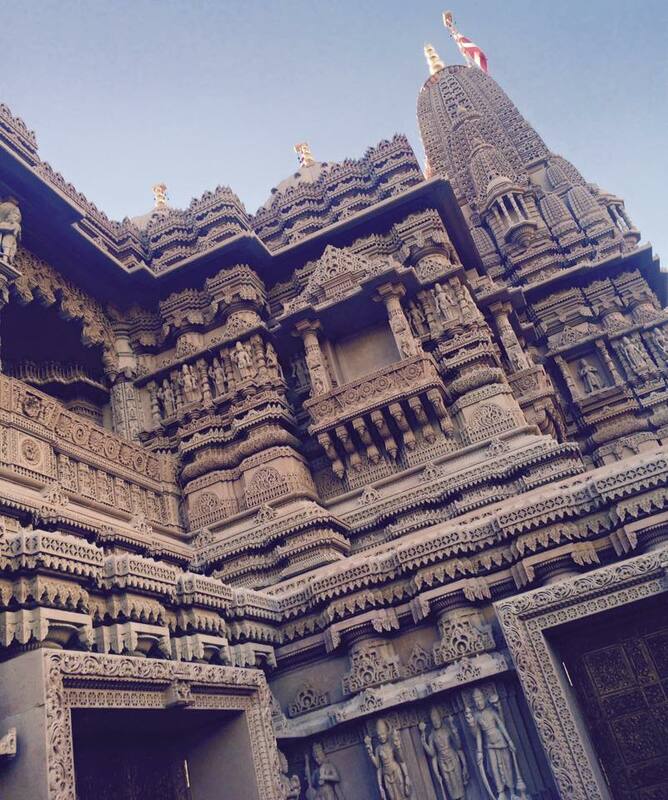 The attention to detail, the awe-inspiring, hand-carved pink sandstone exterior, the ornate materials, the obvious devotion of the Hindu people to their faith and beliefs through the artistry and building of this temple took my breath away. We couldn’t take pictures of the white, Carrara marble interior carvings/structure, but I definitely understand why they asked us to remove our shoes. Truly a wonder and must-see after or before the race. Everything was hand carved in India and shipped over. Talk about dedication to quality. This structure is built to last 1,000 years and has an impressive, state-of-the-art engineered foundation to keep it rock solid regardless of seismic activity. Go see it! 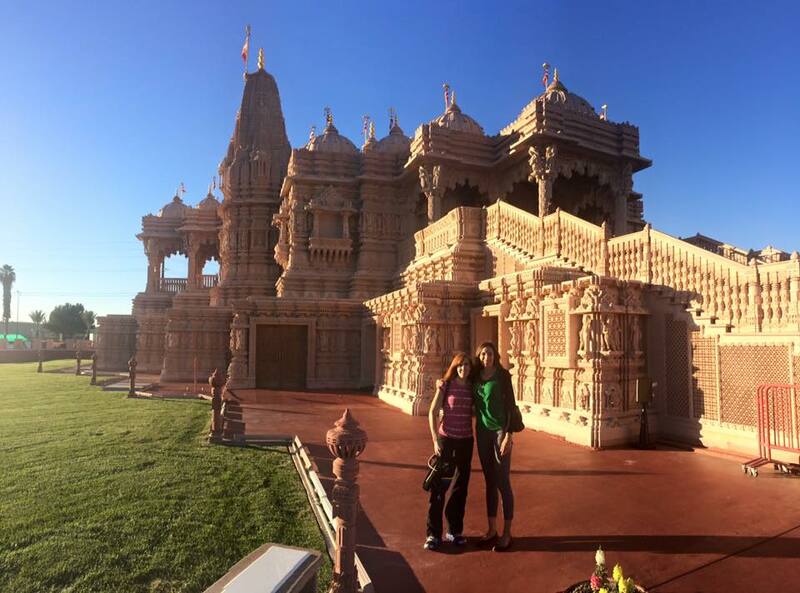 Visiting the BAPS Shri Swaminarayan Mandir Temple with my friend Annie after the race. 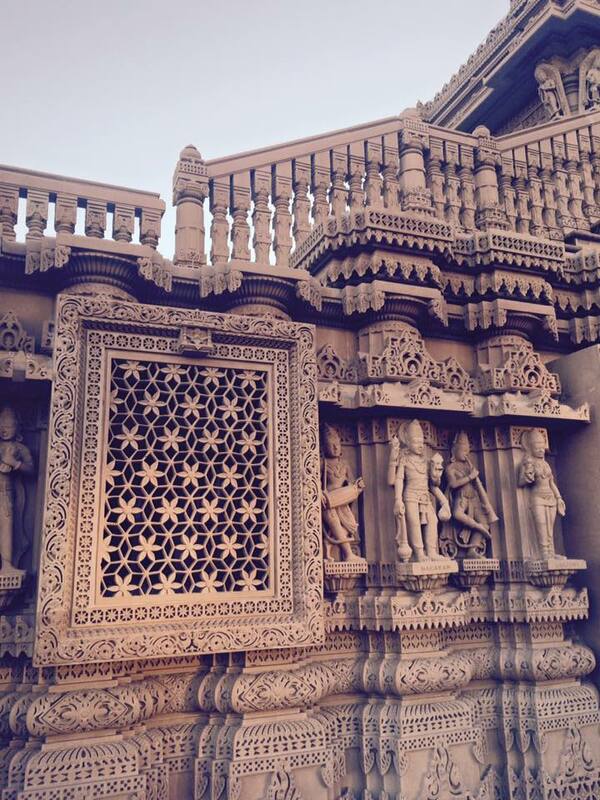 The intricate, hand-carved, pink sandstone of the BAPS Shri Swaminarayan Mandir Temple. Fantastic race report and very well written! You nailed that race! So proud of you. 2016 is looking brighter than ever. It’s hard to imagine topping 2015 but you will because you are a true athlete, gifted and driven. Bravo sweet friend! May your swift wings always bring you to your goals. Super epic finish line picture by the way. That is a total ‘eye of the tiger’ expression. I love it!